If you missed one of our events, we present a quick overview below. USGS Fellow and Noble Gas researcher Pete Barry joined a team of microbiologists, microbial ecologists, chemists and physicists to sample the Earth's interior in Costa Rica to understand the varying constraints and influences on the deep carbon cycle in the subduction zone environment. Pete, and fellow team members Donato Giovannelli and Karen Lloyd flew in specially to Wood Green School in Witney to talk about the project and provide an insight into the life of a scientist working in their field. Attendees at the event in Witney had the opportunity to learn about mass spectrometry and earth observation with other Oxford University researchers. Volcanology expert Dr Karen Fontijn and oil & gas industry expert Visiting Professor Mike Daly, explored the risks and rewards offered by the East African Rift - from volcanoes to helium reserves, methane gas emissions to geothermal energy. Our thanks to Mike for stepping in at the last mninute to replace St Edmund Hall Tutorial Fellow, Professor Richard Walker who had been taken sick. Juliet Biggs, Anny Cazenave, Claude Jaupart, Peter Molnar, John Sclater, Marion Thomas and Peizhen Zhang. Tickets cost £55 (No cost to students) and include the talks, refreshments and lunch, a drinks reception in the department and dinner at Exeter College. A dinner is also available on the Thursday night for alumni and colleagues attending the lecture. Professor Barry Parsons gave a public lecture at the Oxford University Museum of Natural History on using satellite remote sensing to understand earthquake risk. The lecture was given as part of the 2-day celebration of his 70th birthday, followed yb a day of talks by friends and colleagues, supported by the Royal Astronomical Society and COMET. This year we returned to St Hugh's, the college home of our new Head of Department, Chris Ballentine, and also new Faculty member Erin Saupe. Both Chris and Erin gave short talks introducing their research for alumni in the department during the afternoon, where Chris was able to give a quick tour of his lab to those wishing to learn more about modern geochemistry. Our new Head of Department, Professor Chris Ballentine, along with Professors Conall Mac Niocaill and Joe Cartwright, headed to London to catch up with alumni at the Old Bank of England, Fleet Street. Around 30 alumni were able to join us, with groups from the 1990s, 2000s and some of our most recent graduates. Photos of the evening are available on our Facebook page. The 5th annual OUGS Careers Fair provided an afternoon of industry insights from companies and organisations as diverse as the Environment Agency and Met Office, Atkins and Mace, and BP and PESGB. Alumni and industry representatives attending the fair were then able to attend Happy Hour, which this year featured a BBQ and a special appearance of our in-house rock band, which includes postdoc Pete Barry and St Peter's tutor Nick Tosca. See our Careers Fair page for details on the companies attending, and how you can get involved in the future. In celebration of Dave Waters on the event of his retirement from teaching, the OUMNH hosted a day of talks from Dave's colleagues and former students. Speakers included alumni Clare Warren, John Cottle, Owen Weller and Brendan Dyck, as well as Professor Mike Searle and of course Dave himself. Talks were followed by a drinks reception in the department, and dinner at St Cross College. Head of Department, Gideon Henderson, visited Houston Texas on Friday 19th May. The local alumni chapter, OUS Houston - co-chaired by Geology alumnus Kevin Bradford (Univ 1988) - arranged for Gideon to speak on the topic of "Beyond Paris: Carbon Change" followed by drinks at L'Alliance Francaise. The 2017 Alumni Dinner was held at St Peter's College, with all of St Peter's tutors past and present in attendance: as well as current tutor Nick Tosca and fellow Joe Cartwright, we were delighted to welcome back Steve Hesselbo for dinner and Harold Reading for drinks beforehand. Reunion groups gathered from the matriculation years of 1964, 1967, 1977, 1982, 1985 and 1997, to join Faculty old and new: David Bell, Jim Kennedy, Gideon Henderson, Don Fraser, Hugh Jenkyns, Conall Mac Niocaill and Stuart Robinson, as well as Nick, Joe and Steve. During the afternoon alumni enjoyed a guided tour of the Bodleian's Volcanoes exhibition with the Curator, Professor David Pyle. The exhibition was accompanied by a delightful concert of new music dedicated to Volcanoes, played by the Oxfordshire County Youth Orchestra and conducted by St Anne's Musical Director John Traill. 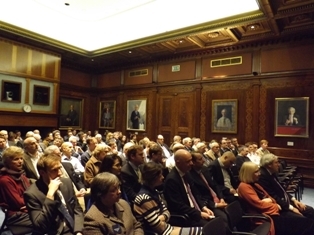 This year's London gathering was held at the Royal Society. Over 50 alumni and guests enjoyed an evening of insight into the many aspects of our "Planet Ocean," inspired by the BBC's recent series "Planet Earth." Short presentations by faulty members Roger Benson, Hugh Jenkyns, Ros Rickaby and Helen Johnson took us from marine vertebrate evolution, through Ocean Anoxic Events, to changes in marine environments in the modern, and the implications for such changes. Gideon Henderson gave a few insights into future research opportunities, such as mining the oceans for minerals, medicines and more. Alumni representing a number of different companies and industries were on hand to talk to students and postdocs about careers outside of academia. This year we were delighted to welcome representatives from BDO Mining, BP, CCS Solutions, Elsevier, ERC Equipoise, Horizon Nuclear Solutions, OUMNH, PESGB, RMS, Shell, Telespazio VEGA, as well as our own Careers Service. Students, friends and colleagues of Professor Tony Watts organised a symposium to celebrate 50 years of his career in geoscience. With talks in the Museum of Natural History, a drinks reception in the evening at the department of Earth Sciences, and dinner in Hall at Worcester College, this extremely well-attended event offered various opportunities to celebrate with Tony. Photos available online soon. Dr Heather Bouman (St John’s), Associate Professor of Biogeochemistry and Dr Helen Johnson (St Cross), Associate Professor of Physical Oceanography presented a dual view of 'Arctic change: rapid warming and its consequences.' The talk, held at the Mathematical Institute as part of the main Alumni Weekend programme, discussed the ongoing and predicted changes in the Arctic and their implications for ocean circulation, biology and global climate. This year's dinner saw an afternoon of activities, including a geological walking tour of Holywell cemetery, led by Dr Nina Morgan (Wolfson 1976) and Phil Powell (Honorary Curator of Geology, Oxford University Museum of Natural History), authors of the new book The Geology of Oxford Gravestones. Retired Univ tutor David Bell narrated footage from a 1966 Greenland expedition, filmed by former lecturer Brian Atkins. There was also the chance to view some of Wager's artefacts from his trip to Greenland in 1956. Dinner was a slightly more informal event than usual, with 'family-style' service in the Dining Hall at St Anne's College. Photos of the event are available here. Professor Ray Pierrehumbert, who recently moved from Chicago to the Physics department here in Oxford, gave the third Lobanov-Rostovsky lecture on the topic of 'The Origins and Evolution of Exoplanet Atmospheres and Oceans.' The lecture will be made available online soon. For details of previous speakers, please visit the Lobanov-Rostovsky Lecture page. Univ Geologists who matriculated in 1975 enjoyed a reunion weekend in Oxford on Thursday 24th March. The visit, organised by Andrew McCormick, included a tour of the department, drinks at Happy Hour in our rooftop common room, dinner in Univ, and breakfast with Professor David Bell on the Sunday. This year's London gathering had more of an informal nature, as Univ tutor Lars Hansen translated his research on rock rheology into explanations of the pattern of bubbles in a glass of beer, ketchup on chips, and the forces inherent in velcro and bubble wrap. We were joined by around 25 alumni from across London and the South East, accommodated once again by the inimitable Old Bank of England on Fleet Street. Our annual careers event allows us to connect with alumni in companies and industries reliant on the next generation of earth scientists, whilst also providing a showcase for our students who wish to know more about the career options available to them. If you are interested in representing your company at this event, please contact the Alumni Office or call Claire Grainger on +44 (0) 1865 272031. Professor Chris Ballentine gave a fascinating talk in the department on the topic of ”Ancient Water: A hiding place for life over planetary timescales.” Chris has been exploring ancient rocks deep in the Earth’s crust, which have been found to produce much more hydrogen gas than previously thought — a situation on a par with conditions near hydrothermal vents, which host thriving ecosystems. Scientists once thought that such subsurface microbial ecosystems consumed energy that filtered down from the Earth's surface, implying that such ecosystems ultimately depended on sunlight and photosynthesis. Chris explained how the discovery of such ecosystems provides a road map with which to search for deep microbial life on Earth and possibly Mars. Attendees then joined us for a drinks reception on the rooftop terrace of the Earth Sciences Building. Jo Fleming (Hertford 1987) organised a gathering of the 1987 matriculation year group, who attended Chris Ballentine's talk (see above) and drinks reception, before repairing to a local restaurant. Bruce Levell (St Catz 1972) worked extremely hard in organising his year group's reunion, to celebrate 40 years since graduation. Attendees from the US and Australia anjoyed a tour of the department and museum, a sneak peek into the old building, followed by dinner at Lady Margaret Hall, and drinks in the Lamb and Flag afterwards. The day was made even more complete by fine weather and special appearances by former lecturers Keith O'Nions, Harold Reading and Jim Kennedy. This year our annual Alumni Dinner was held at St Cross College, featuring reunions for the matriculation classes of 2009, 2005 and 1989. Click here to read more about the dinner. Alumni, guests and fellow researchers gather in the Royal Society to discuss how universities such as Oxford - and our alumni - might work with and in nations in the developing world. Whether with multinationals developing resources; governments as they plan environmental policy or in education: teaching individuals, and helping institutions in developing nations to improve and modernise curricula. We also thank all those alumni who attended, and contributed to the lively debate afterwards. This year's lecture entitled "The formation of terrestrial planets" was given by Alessandro Morbidelli of the Observatoire de la Cote d'Azur in Nice. This was the second of our annual public lecture series in Planetary Geology held in collaboration with the Physics Department, to which all our alumni and interested guests are invited. The lectures in this annual series are recorded and made available after the event. Please click here for more information on the lecture series. This year, Sollas dinner attedees were offered the opportunity to make the most of their trip by joining us for soem related activities during the afternoon. Dr Dave Waters provioded a fascinating behind-the-scenes visit to the newly refurbished Oxford University Museum of Natural History, where he is working on the collection of samples Wager brought back from Everest on his 1933 expedition. There was a chance to chat with students about careers and other opportunities before joining researchers and academics at the Friday Happy Hour. Professor Myles Allen, Head of Oxford's Climate Dynamics Group. Dr Nick Eyre, Jackson Senior Research Fellow in Energy at Oxford's Environmental Change Institute. Professor Joe Cartwright, Shell Professor of Earth Sciences (Jesus 1977). 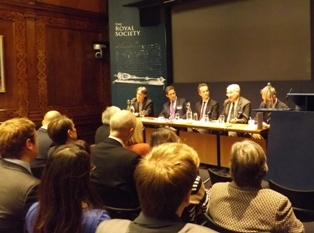 The event was hosted and moderated by our most recently-appointed Fellow of the Royal Society and Head of Department Professor Gideon Henderson (Hertford 1986). While the discussion was conducted under Chatham House rules, we shall be presenting a flavour of the evening in our alumni magazine article in the autumn. For the inaugural lecture in our exciting new annual series, we were delighted to welcome Lindy Elkins-Tanton from the Carnegie Institute Washington, here for the week as visiting Astor Lecturer in Physics and Earth Sciences. The lecture was hosted in the Martin Wood lecture theatre in the Clarendon Laboratory and is now available as part of the iTunesU podcast series. We were delighted to see so many of our alumni in and around Aberdeen join Head of Department, Gideon Henderson, at the suberbly-named Granite Park restaurant for a three-course dinner and convivial discussion of academic developments and their potential impact in the field. The matriculation class of 1982 even held a mini-reunion at the dinner, which we hope will become a regular event. A wonderful networking opportunity for Oxford alumni during the Earth Sciences 4th Year undergaduate field trip! Students, Faculty and alumni were hosted by Gareth Roberts (SEH 1971) at Red Steakhouse & Grill on Front Street, Hamilton. The new Governor of the Island, Geordie Fergusson, was in attendance, along with Head of Department Gideon Henderson, and Teddy Hall tutor Hugh Jenkyns. The Department of Earth Sciences held an Open House on the afternoon of Saturday 21st September for Earth Sciences and other interested alumni during the University Alumni Weekend. Professor Mike Searle introduced his new book, ‘Colliding Continents’ to a packed audience in the seminar rooms, with an opportunity to ask questions and purchase signed copies of the book afterwards. Many guests then stayed on for the Drinks Reception, taking in the rather stunning views from our rooftop terrace. Dr Matt Friedman brought his palaeobiology research to life as part of the main Alumni Weekend lecture series based at the Saïd Business School. Both lectures are available online as part of the Alumni Weekend package. Rhodes Scholars are welcome to visit the Department as part of the 110th anniversary celebrations of the Rhodes Trust. On Friday 20th at 3pm there will be a special screening of Thin Ice. This 70 minute documentary produced by former Oxford Earth Sciences lecturer, Simon Lamb in response to growing confusion and scepticism about climate change, captures the work of climate scientists around the world. Peter Clift organised an action-packed reunion for the BA Geology 1984-87 group. A field trip on the Saturday included a stop in Islip to view the grave of William Buckland, first Professor of Geology at Oxford, and Rector of Islip. The group then visited the McKerrow trail in Kirtlington Quarry, followed by lunch in the Chequers in the village of Churchill, birthplace of William Smith. This was followed in the evening by dinner at St Edmund Hall. The Alumni Dinner was held at St Edmund Hall, with a drinks reception in full evening sunshine in the Front Quad. Groups of alumni who matriculated in 2003, 1993, 1963 and 1953 were joined by small groups from the late 200s, 1990s and mid 1980s. It was wonderful to see people greeting their old tutors - Harold Reading, David Bell, Steven Moorbath, Hugh Jenkyns and Gideon Henderson - as though it were only yesterday. An afternoon of remembrance for the life of Professor E.A. (David) Vincent, who passed away on 24th December 2012 aged 93. David was Chair of the University of Oxford Geology Department from 1967 to 1986 and a fellow of University College. Former colleagues - academic, technical and administrative, alumni, and members of David's family were welcomed for the afternoon which included short talks on his life and work by Brian Upton, Jack Zussman and David Vaughan. Gideon Henderson spoke of the legacy of David's work which is still in evidence in the modern Department, and officially named the Vincent Mineralogy Lab. Samples of David’s photography were on display for guests to view and the afternoon was rounded off with refreshments in our upstairs lounge. Alumni attended the Department to offer informal careers advice to current students. Alumni at different stages in their career were able to give concrete examples of career progression and opportunities open to Earth Sciences graduates which were hugely interesting and valuable for the students. Alumni living and/or working in London were invited to join the new Head of Department, Gideon Henderson, as well as new Teddy Hall lecturer Richard Walker and Worcester Fellow Don Fraser, in the Old Bank of England, Fleet Street. There was a great turn-out, with alumni from overlapping year groups finding much in common, and plenty to chat about. Photos of the event can be viewed on the Earth Sciences Facebook page. Current students involved in GeolSoc organised their own in-house recruitment fair. Alumni working in companies either directly related to Earth Sciences, or where Earth Sciences skill sets are highly prized were invited to attend. This provided a great opportunity for smaller companies to raise the profile of their company, and demonstrate their industrial expertise to the bright minds of the future. Students and alumni all agreed the event was a great success, and we hope to continue with this as an annual event. Faculty from the new Shell Geophysics research team met with alumni in Houston for dinner and an update from the Head of Department Gideon Henderson. Professor Joe Cartwright, Professor Steve Hesselbo, Dr Hugh Jenkyns, and Dr Don Porcelli joined 13 alumni at Perry's Steakhouse & Grill, Katy Freeway, Memorial City and we very much hope to repeat the occasion the next time the team is in town! If you live or work in or near Houston, but were not aware of the dinner, do let us know so we can inform you next time.